Sweet aromas of dried rose petals and raspberry sorbet mingle with dark malted grain on the nose. This cider is a mouth full of sweetness, acid and tannin, rich in body and flavor. The long finish is more mouth watering acid with soft tannin lingering. 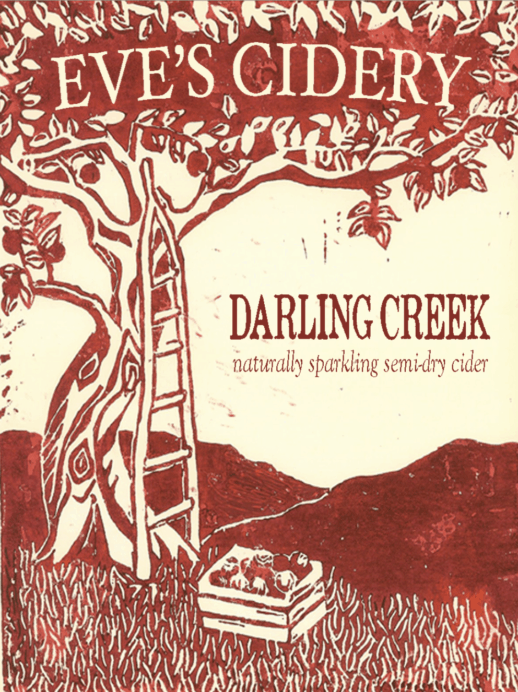 The 2016 Darling Creek is by accident one of the best ciders we have ever made. For starters, we have an un-known rootstock growing in our Newfield orchard which produces incredible cider apples and which we call ‘Krys’. In 2016, even though we lost the majority of our other apples to a late freeze which killed the blossoms, the Krys produced a decent crop of apples with high sugar and searing acidity. We decided to blend at the press with Somerset Redstreak for it’s lovely bittersweet tannins. All the 2016 fermentations took forever, but by the time summer rolled around we realized this still-sweet tank was not going to finish fermenting. So we tried an experiment, a sort of pet nat champagne hybrid. We bottled the high residual sugar cider with champagne yeast and disgorged. The crazy high brix of the 2016 juice had enough sugar to leave us with 34 grams per liter residual sugar and still achieve 7% alcohol and balance the insane 10.8 grams acidity. The natural sparkles are from a continued primary fermentation, rather than through added sugar – and the remaining sweetness is residual rather than returned.